Something slightly different then hog roast or BBQ. 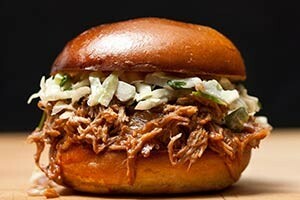 Pulled pork is tender, juicy tasty option for any occasion. Slow cooked for 6 – 8 hours for that perfect taste. Shredded by hand, mixed with bbq sauce and served in brioche buns with coleslaw salad.